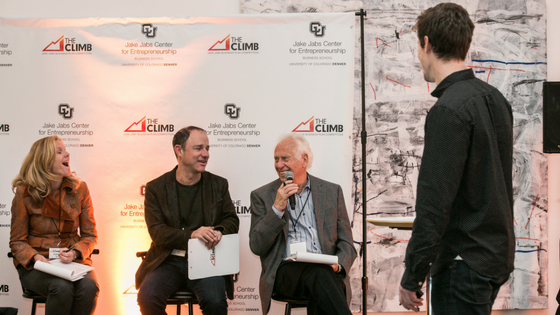 Space Gallery buzzed with excitement on Tuesday, November 7th, 2017, as aspiring Colorado entrepreneurs pitched their business ideas at THE CLIMB | Collegiate & Community Pitch Night. 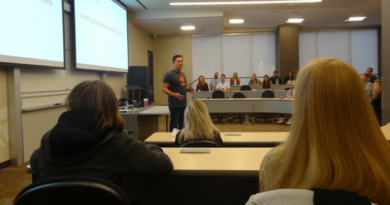 Hosted annually by the Jake Jabs Center for Entrepreneurship, five collegiate and four community teams pitched front of a panel of esteemed judges and a record-breaking audience of 150 people. This year’s competition featured an online craft beer marketplace, a meal planning mobile application and companies wanting to do social good. 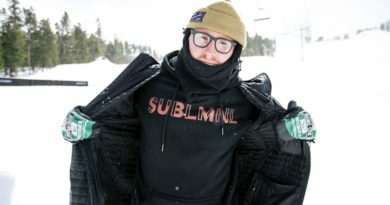 “There’s a very diverse group of entrepreneurs within Denver that are trying to solve some really cool problems here that have meaningful impact on society,” said Caleb Polley, first place winner in the community category. His company, Boogaloo Beds, wants to improve sleep, safety and sensory control for people with autism, dementia and sensory processing disorders. 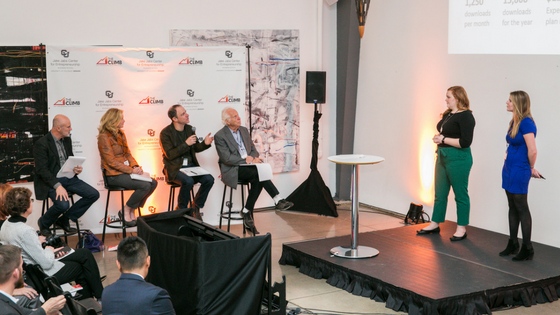 Michael Potts, Managing Partner at Advance Wave Partners; Stephanie McCoy, Chief Operating Officer of Wazee Street Capital Management; Joel Appel, Owner and CEO of Launch Pad, LLC; and Jake Jabs, President and CEO of American Furniture Warehouse and Jake Jabs Center namesake, were tasked with judging all nine pitches. Molly Hughes, communication consultant, executive coach and former anchor at CBS4 Denver, served as emcee for the evening. The evening began with five pitches in the collegiate category. Chloe Canterbury and Christa Corrigan of Pantree answer judge Joel Appel. First was James Fazzio of Nutrition Leaders, a company that provides research-based nutrition consultation and education by registered dietitians. The company serves to provide in-person group classes, online education and one-on-one consultations. Second to pitch were Christa Corrigan and Chloe Canterbury of Pantree, a smartphone application with a barcode scanner. The app is a modern-day cookbook designed to help users track their food purchases and come up with recipe ideas based on what’s currently in their kitchens. Fourth came Charles Stanley with his company, Local Beer Connection (LBC). Stanley’s goal is to provide fellow craft beer lovers with a greater access to local breweries, allowing them to order beer from over 1,000 breweries in the Denver metro area and pick it up at a local retailer. The final contestants in the collegiate category were Omeed Saghafi and Henry Duong of Diagnosis AI. Their artificial intelligence system “DexMD” provides medical patients with reminders, answers to questions, and treatment recommendations, all in the comfort of their own homes. Next up were four pitches in the community category. 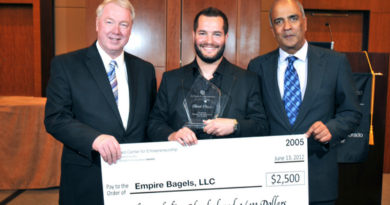 Caleb Polley of Boogaloo Beds makes the judges laugh during his Q&A. Polley of Boogaloo Beds pitched first. Second was Craig Canon of Spinhead Media; his “Spinheads” are over-7-foot-tall structures that hold signage to help people navigate special events, road construction, and emergency situations while reducing frustration and anxiety. Molly Schaefer pitched her company, Silver Spoons Kitchen, third. Passionate for the aging community, Schaefer hopes to empower the aging population to live independently by providing seniors with nourishing meals and companionship. Last but not least, James and Samantha Gardner (a wife and husband duo) closed out THE CLIMB after pitching their company, Milk Stash. The idea was “born” after the birth of their daughter and Gardner was frustrated with the tediousness of tracking and storing her breast milk. Milk Stash is an end-to-end solution for breastfeeding moms, equipped with a refrigerator storage tray and smartphone application to help track of inventory. Jake Jabs helped announce the winners. In the community category, Boogaloo Beds won first place and $2,000. Spinhead Media came in second place, winning $1,500. 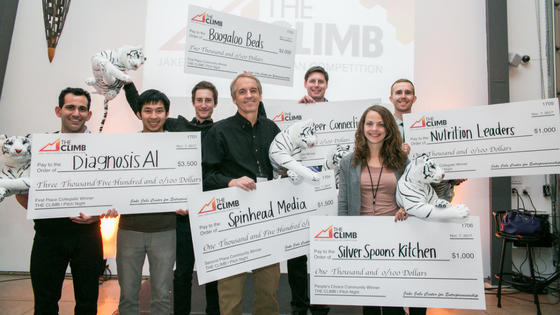 Silver Spoons Kitchen won the $1,000 People’s Choice Award, which attendees granted to their favorite startups by voting in real-time using a mobile application developed by Brainspire. In the collegiate category, Diagnosis AI won first place and the grand prize of $3,500. Local Beer Connection came in second place, winning $2,000, and Nutrition Leaders won the $1,000 People’s Choice Award.